What Happens to a Homeless Veteran? Jymm Has Two Purple Hearts. He Left L.A.’s Streets to Live on His Own—Then Ended Up in the Hospital. 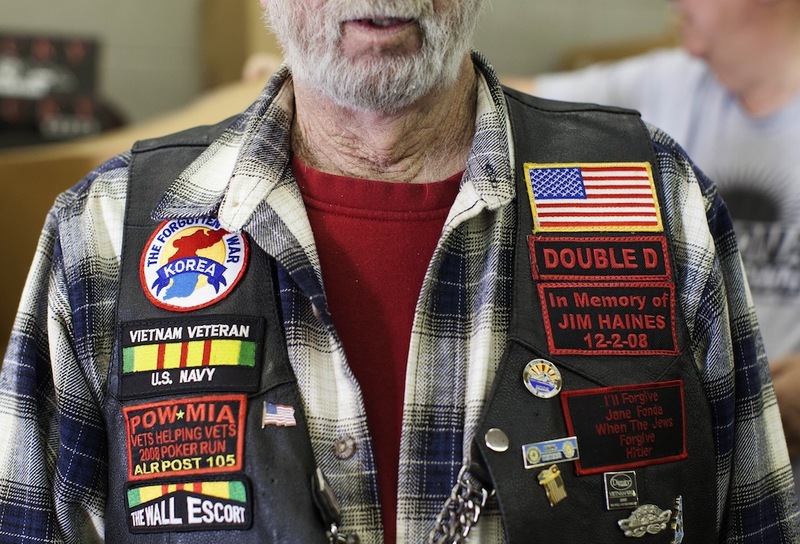 Jymm is a Vietnam vet with two Purple Hearts who ended up homeless in Santa Monica. When I met him, he’d been on the streets off and on for about two decades. He was not alone. In fact, there are 6,300 homeless veterans in L.A. County, the largest concentration in the U.S. At a summit held yesterday in Century City, First Lady Michelle Obama said the idea of even one homeless veteran should “horrify us all.” But back when I met Jymm in 2008, he was highly suspicious of shelters, homeless services organizations, and the Veterans Administration. Staff at the nonprofit Access Center in Santa Monica, where I worked as a homeless services case manager, didn’t always know quite how to deal with Jymm. He was, to put it mildly, a character. His preferred attire was a skin-tight Minnie Mouse T-shirt with bright pink windbreaker pants. Jymm had passionately articulated opinions about everything. When I first met Jymm, he did not want to go to a homeless shelter—to be subject to its (sometimes) arbitrary rules and curfews. Over time, we developed a bond of trust through which he eventually allowed me—despite his misgivings—to help him access shelter and move into a safe haven program. I left my case management job in 2010 but stayed in touch with Jymm. I was happy to see him move into his own home in Santa Monica with Veterans Affairs Supportive Housing (VASH) assistance. He struggled to acclimate to apartment living after decades of a survival-subsistence lifestyle on the street. As a result, many of his decisions could seem pretty unreasonable, from hanging onto his “favorite” but broken drinking glass to redeeming damaged furniture from dumpsters. But Jymm valued his freedom and independence, which having his own apartment provided. Over the next three and a half years, I wasn’t able to check in on him as often as I’d hoped, since I was doing some traveling and busy with work and graduate school. And I worried. Due to Jymm’s age and mental health struggles, he needs frequent home visits. At first, I was reassured to know that he would receive case management from the VA and be followed by their Assertive Community Treatment (ACT) team, a mobile intervention group of clinicians dedicated to supporting people like Jymm. But when I visited Jymm at his Santa Monica residence on several occasions, I saw little evidence that he was receiving the level of support he needed—based on the condition of his apartment and comments he made about the VA. In late May, Jymm called me from the psychiatric ward at the West Los Angeles VA hospital. “They’ve got me under lock and key,” he told me. He’d been involuntarily hospitalized over concerns that he wasn’t properly caring for himself. He had an upcoming conservatorship hearing and wanted to know if I would serve as his conservator—in effect take legal responsibility for his life decisions and well-being. After some thought, I decided to make that commitment to my friend. On the morning of Jymm’s hearing, it quickly became apparent that the VA’s agenda was to strip him of his rights and keep him hospitalized. Members of the ACT team testified that Jymm had been visited on a weekly basis. They cited legitimate concerns about Jymm’s hygiene, cleanliness, and food storage, but it didn’t appear to me that anyone had worked with him to develop strategies to address these issues. Jymm’s many idiosyncrasies were also brought up as evidence that he was gravely disabled—for example, his habit of wearing shirts with holes in them and his preference for short shorts. Jymm has never hurt anyone (or himself). Where is the distinction between pathology and personality? When does a person’s preferences in dress and lifestyle stray from the norm—and at what point can we deem those preferences a pathological inability to care for oneself? And is a possibly indefinite incarceration in a drab hospital really an improvement over Jymm living a life of his choosing? I’m no stranger to the challenges of enabling folks like Jymm to live successfully on their own. I’ve managed a supportive housing program for homeless individuals with mental illness for the past year, worked in the field of homeless services for more than four years, and completed original ethnographic research on exactly this subject. With the right level of support, Jymm could live in his own apartment and maintain a level of autonomy. As a decorated war veteran, he deserves to receive quality care that empowers him to live on his own terms—even when those terms don’t match up with clinical perspectives on so-called “normal” or “acceptable” behavior. We owe our veterans—and all those who are socially marginalized—adequate support without undermining their freedom. We’ve embraced this idea with our intellectually disabled, where some regional centers provide 24-hour support with individual autonomy as the focal point. Why not with those struggling with mental illness? When he had a chance to speak at the hearing, Jymm’s voice broke as he told the judge that he just wanted to go home to his apartment. But the VA was dead set on keeping him in the hospital. A public guardian made a recommendation to the judge about who would become Jymm’s conservator—me or the public guardian’s office. The public guardian took the word of a psychiatrist who has known Jymm for three weeks over mine—even though I have been friends with Jymm for six years and have deep experience in providing supportive housing for formerly homeless people struggling with mental illness. After asking me to step forward, the judge dismissed any comments I might have made with a glib remark about how I was certainly well-intentioned. The judge’s mind was already made up. It seems likely that Jymm will remain hospitalized. His best shot at getting out is likely a board and care facility, where he will have limited license to be himself. The public defender urged him to contest the conservatorship, but by then his apartment will be lost. His subsidy from the VA will be gone. He will have few options and will quite possibly return to the streets in an attempt to redeem his dignity and self-respect. After the hearing, these people—who had been ostensibly providing care to Jymm—walked out without a single word of comfort or consolation to the man whose life they’d just hijacked. After trying and failing to get their attention, Jymm just stood there bewildered and heartbroken, as the escorting hospital staff prepared to bring him back to his cell. To be clear, I am not opposed to the idea of involuntary hospitalization when someone clearly lacks the insight and ability to meet their own basic needs, or when they represent an immediate threat to themselves or others due to a psychiatric disability. In my work, I decided to have people involuntarily hospitalized for this very reason. And I have known of situations in which mental health professionals decided not to intervene with tragic consequences. I am no stranger to how frustrating it is when someone who truly cannot care for himself is not cared for appropriately, and is instead released to the streets by the court and mental health system. But Jymm has strengths that could be built upon. And we owe it to those most vulnerable in our society to provide the right level of support so they can live with freedom and dignity. Certainly it is within the realm of possibility to balance a humane acknowledgment that someone requires a higher degree of care with his own desire for freedom and autonomy. Jymm called me about a month after his hearing. He was discharged from the VA hospital and deposited at a board and care facility way out in the Valley. He told me that it was really nice and that the staff was well-mannered—a sharp departure from what his reports on the psychiatric unit at the VA. He said that he was glad to have a little more freedom, but that the location felt remote and unfamiliar. He shares a room with two other people and is uncomfortable with the lack of privacy—and regretful that his roommates are not good conversationalists. Jymm sounded OK, and I was heartened to hear it. But his desire to return to the freedom of his own apartment has not diminished. Jymm is receiving care that he needs, but on terms and in a location that are not of his choosing. I can’t help but question whether this was the only solution. Jymm fought for us. Why aren’t we fighting for him? Tully Mackay-Tisbert is an associate director at a nonprofit organization serving homeless individuals with a mental illness in the Los Angeles area. He has a master’s degree in applied anthropology from California State University Long Beach. *Photo courtesy of REUTERS/Samantha Sais.